Puppies are things of pure joy. Everyone loves the big proud dogs they grow up to be, of course, but there is something infinitely soothing about cuddling up beside a newly born pup. 1. You think you’ve seen tiny? 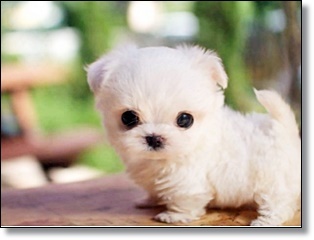 Well, you’re wrong, because you haven’t seen this puppy before. 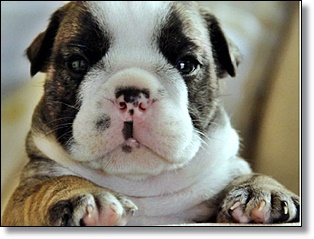 And this puppy? He is 100 percent tiny! Thankfully, what he lacks in size he’s more than willing to make up for in attitude. 2. Aww! What’s better than an adorable, doe-eyed, floppy-eared puppy, you might ask? 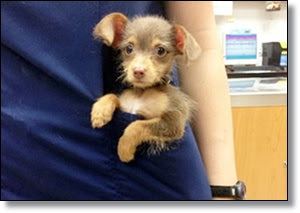 Why, that would be an adorable, doe-eyed, floppy-eared puppy who is so tiny that you can tuck him into your pocket! 3. Some dogs love taking a bath… that is, once they get used to it! 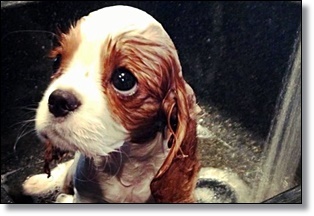 This puppy’s shock and indignation at being forced to take such a dip would be very tragic indeed if it also wasn’t one of the cutest facial expressions around. 4. 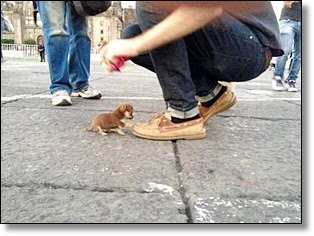 When puppies are small, it can seem as if everything is so big and exciting. For this little guy, every single day holds a million new discoveries just waiting to be made. Today’s discovery? Shoes. 5. 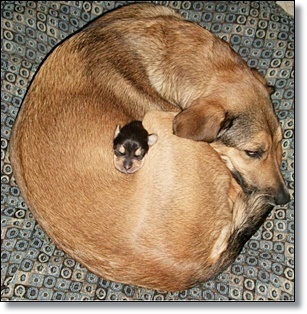 Snuggle buddies for life! 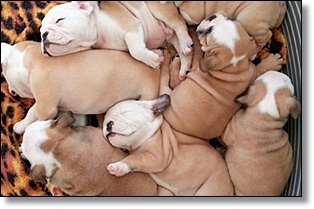 They say that being born into a big family can be stressful, but clearly no one told this massive litter of puppies about the stress big families can bring. 6. You’ve probably heard that dogs hate soda (and, to be fair, they shouldn’t be drinking it anyway), but this is just a lie started by a cat. 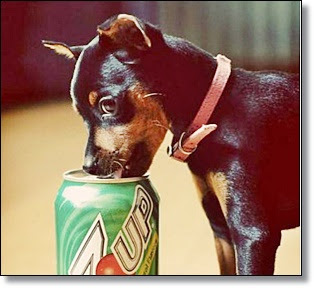 There is, in fact, almost nothing else that makes a pup lick their lips in anticipation quite like a delicious 7 Up! 7. Peekaboo! He sees you. The question is… do you see him? 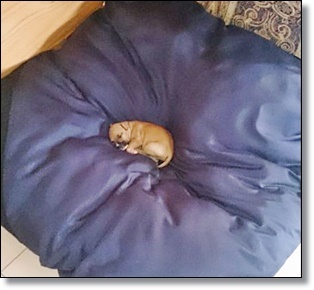 This pup is so teeny-tiny that every time he decides to take a nap it’s like a new installment of Where’s Waldo? Except this time, it’s the Sleepy Puppy Edition! 8. 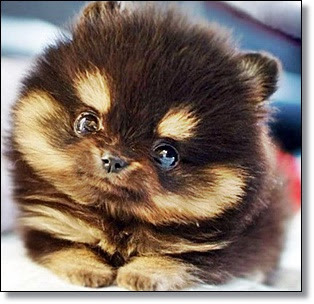 Here’s a little known fact about this utterly adorable floof: If you stare into his eyes long enough, pure candy goodness will rain from the clouds. You might also find that you have developed the ability to levitate. 9. 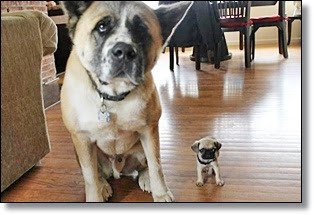 “I shall call him Mini-Me.” Every dog needs a furry friend of their own, and if you’re going to get your pet their own pet, why not make it one that could also double as their very teeny-tiny identical twin? Totally genius. 10. 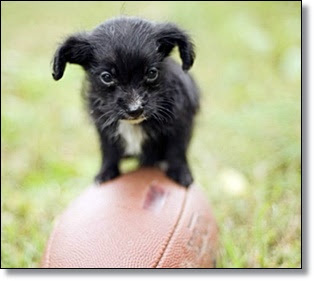 They told this puppy that he was too small to be on the football team. Sure, he was a brilliant offensive lineman, but only against opponents like his tiny stuffed bear, Mr. Stuffy, and his bitter rival, Mom’s Sock. 11. “We’re super cute, huh?” Somebody clearly knows that they are adorable. Normally you would worry about these animals getting big egos, but it’s clear that these two have nothing but more love to share with the world! 12. In France, it’s normal to start your day off with a freshly baked croissant. This big dog clearly heard of this tradition and, in lieu of eating actual croissants herself, she opted to become one… with a tasty puppy filling. 13. This chubby little dog is actually pretty darn small, but you would never know what with that massive ball of floof covering his entire body. 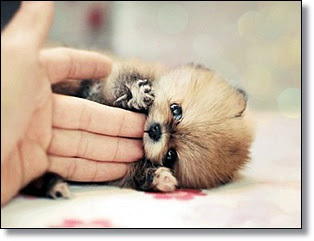 A creature that needs to be protected and cuddled? Sign us up. 14. This dog might be way too young to run for president, and also way too much of not-a-human-being. Still, you have to admit that when it comes to posing for presidential pictures, he’s got the look down—and then some! 15. “I really like belly rubs!” And we like giving them! When you’re this adorable and you seem to be constantly begging for scratches and cuddles and pets, how could we not? 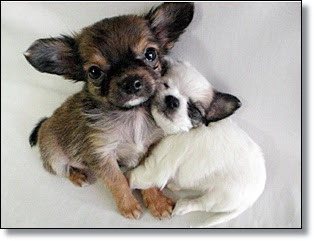 Thank goodness this little puppy seems keen for all the cuddles she can get! 16. 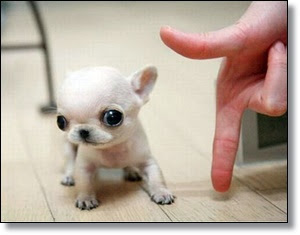 “I’m a fox!” Here is how many people you are fooling with this ruse, little pup: absolutely no one. This adorable doggo might like to pretend that he’s a fearsome beast of the wild, but he couldn’t be more wrong. 17. “How’s it hangin’? Oh, me? 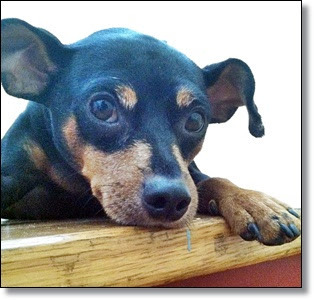 I’m just chillin’.” This cool pup knows he’s the cat’s meow, so to speak, and he hasn’t a care in the world. Well, except for whomever he’s looking at. 18. This photograph would almost be picture-perfect were it not for the creepy fingers above the pup placed there to indicate just how tiny she was. It’s almost as if these two are reenacting the claw game at the arcade! 19. 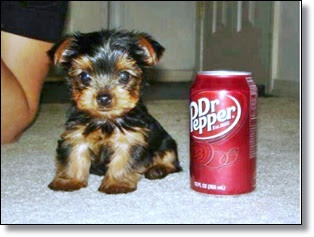 “You can call me Dr. Pupper.” You’ve always heard that there is a “secret ingredient” in Dr. Pepper. 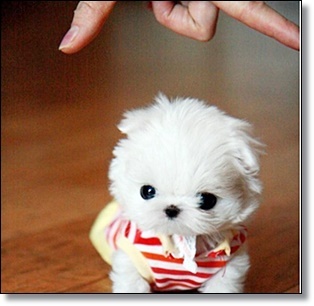 Now, this puppy isn’t saying that he’s responsible for said “secret ingredient,” but he’s also not not saying it. 20. 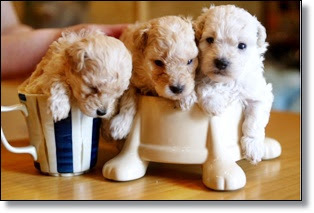 “I’m a little teacup… wait, shoot, that’s not how it goes!” These puppies may not be very good at remembering the words to little old nursery rhymes, but the fact that they are so itty bitty more than makes up for it. 21. 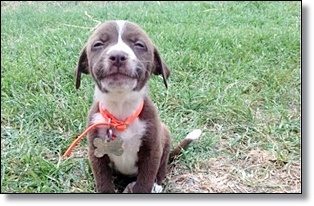 Say “cheese!” This puppy is so cute, that smiling big for the camera just comes naturally to him. Look at him posing like it’s his first day of school! All he needs to complete the look is a backpack and a brown bag lunch. 22. 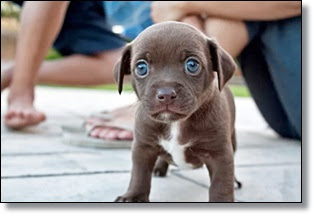 Ol’ Blue Eyes, Frank Sinatra, may have been the king of the Rat Pack, but this dog is definitely king of the Pup Pack. It’s better that way. They don’t smoke, drink, or gad about with leggy blondes in Vegas; rather, they cuddle and howl to the sound of their own tunes.